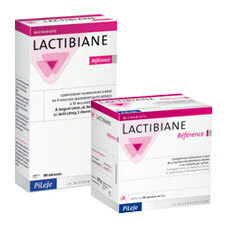 Lactibiane Référence contains 4 microbiotic strains in the dose of 10 billion each per capsule or per sachet. The bacterial strains in Lactibiane Référence have undergone a stringent selection. Microbiotic strains in Lactibiane Référence selectively bred by PiLeJe are registered in the National Collection of Microorganism Cultures (CNCM). Take 1 sachet daily diluted in a glass of water. Use before meals. Potato starch, dextrose, chicory root fructooligosaccharides, lactic ferments, maltodextrin, carrier: cellulose. Bulking agent: corn starch, lactic ferments (carrier: potato starch), capsule of plant origin, anticaking agents: magnesium stearate and silicon dioxide.